The big advantage of having broadband Internet access (instead of the ISDN access which I had before) is not the speed of the link, but the fact that my home is constantly connected to the Internet. This enables many applications, but it also requires that I keep the networking equipment in my home constantly powered on. I decided to measure the power consumption of the devices in my home that are permanently network connected to see how much power this is consuming. I get network services from UPC. They supply me with a cable modem that consumes 6.1 watts and a wifi access points that consumes 6 watts or power, so this means that I need 12.1 watts to keep my broadband link active. 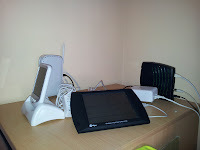 However, I also have some equipment at home which is left permanently switched on to use this network connectivity. I have a current cost electricity monitor that tracks my electricity usage at home and a bridge device that uploads the data to a tracking web site. In total this requires only 2.8 watts (it is good that the device is very power efficient). I also have a Tonido plug which is a small very small Linux server that can do a number of things. The most important thing from my point of view is that it uploads weather data from the weather station in my back garden to my personal weather web site and it also runs some software to help with my project to determine the accuracy of weather forecasts. It consumes 5.1 watts. This leads to a constant power consumption of 20 watts, which translates to 14.4 Kilowatt-Hours per month which would cost about €2. I think that €24 per year is a small price to pay for the convenience of being constantly connected to the digital world.